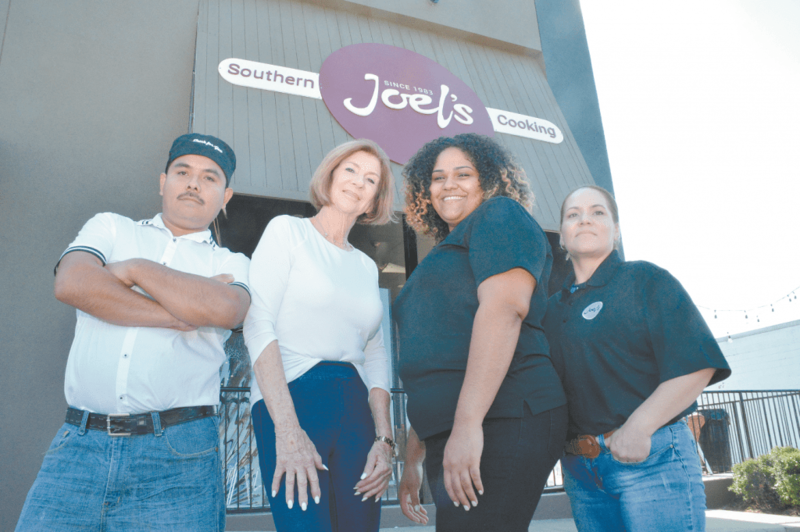 The Joel’s Southern Cooking restaurant team includes, Arturo Arteago, June Matsos, Krystal Elaine Johnson and Cecilia Arroyo. Journal photo by Jordan Wald. The experience he describes in “Southern Food: At Home, on the Road, in History” is similar to the one diners get when they enter Joel’s Southern Cooking in Vestavia Hills, a restaurant that serves up traditional Southern cuisine in the meat-and-three style that is quintessentially Southern. Recently sealing the restaurant’s title as Yelp’s number one spot to savor a meat-and-three meal in the Birmingham area, head chef Arturo Arteago has offered up one of his favorite recipes – perfect to pair with any holiday meal, whether classically Southern or not. Arteago has proven that you don’t have to be born in the South to be a true Southerner. A native of Guerrero, Mexico, Arteago honed his craft at the Culinard Culinary School in Birmingham and has been a chef for 14 years. He started out at the original Joel’s in Trussville before helping open the Vestavia Hills location in October 2017. The list of meats and sides being served for lunch change daily, but visitors can always expect to have about four meats to choose from – always count on fried chicken – and a pick of sides, from casseroles to peas, beans and greens. One of Arteago’s favorite sides to serve, especially during the holidays, is a traditional sweet potato casserole. “This sweet potato casserole is fairly simple and traditional, leaving the flavors of the sweet potatoes and pecans to really shine through,” Arteago said. He feels the almost dessert-like side dish is the perfect addition to a Thanksgiving, Christmas or Easter table. That being said, it is also simple enough to whip up for a Sunday supper. “The sweet potato is a nutritional powerhouse – a source of beta-carotene, as well as Vitamin C and potassium,” Arteago said. “Cooked sweet potatoes are also a good source of fiber. “Not only are they nutritious and delicious; the best part is that this sweet potato casserole is not expensive, meaning this easy side won’t break the bank,” he added. First, preheat the oven to 350 degrees. Cover and bake the sweet potatoes with a bit of butter until tender, then peel and mash. Next, mix well the sweet potatoes, eggs, melted margarine, milk, white sugar and vanilla. Pour the mixture into a large pan. Create the topping mix by combining the plain flour, chopped pecans and dark brown sugar. Add the topping lightly on top of casserole. Cover the casserole with aluminum foil. Bake 40-45 mins.